It’s that time of year again. The NHL regular season has begun. While teams around the league jump into action, the Tampa Bay Lightning have a few extra days to rest and heal up. Yes, you heard that right. The Lightning are already banged up. Winger Ryan Callahan has been placed on injured reserve (IR) as he recovers from May shoulder surgery and Nikita Kucherov missed nearly a week of training camp before returning to practice Monday. All signs point to him being available for opening night, a relief to Lightning nation. Then there’s Tyler Johnson. The center turned winger on a deep roster missed a week and a half of practice with an upper-body injury. When he returned on Monday, he was limited to drills that involved no contact. Head coach Jon Cooper says the odds of Johnson being ready for Saturday’s opener are about 50/50. While it’s never good news when a player misses time due to injury, the Lightning are well-equipped to handle the adversity. 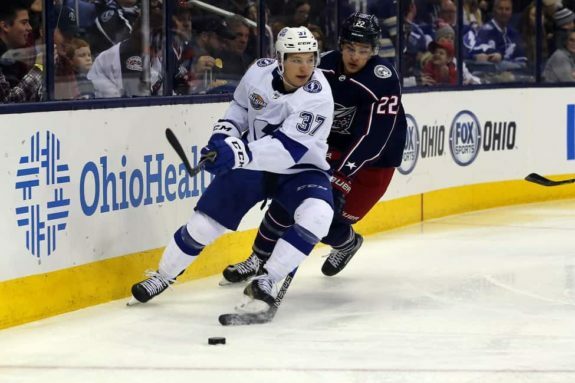 Thanks to strong drafting and maneuvering by former general manager Steve Yzerman, plus a great development system in the AHL’s Syracuse Crunch, there are more than 24 guys that are NHL ready. Related- How Deep are the Lightning? Even the Lightning themselves have players capable of a top-six role toiling on the third line because of an overabundance of qualified candidates filling each position up front. Simply put, this team has options when it comes to overcoming any obstacles thrown their way. After enjoying a breakout rookie season, Yanni Gourde was penciled in as the third line’s left winger to begin training camp. His usage varied throughout camp, as he saw action on both the second and third lines. Monday’s practice brought a new sight, though. With the team beginning its preparations for Saturday’s opening night, Cooper placed Gourde alongside Ondrej Palat and Brayden Point on the Lightning’s second line. The move made sense, with Johnson’s status up in the air for the time being. For a player like Gourde, the move probably felt like an early Christmas present. After paying his dues in the AHL and ECHL for six years, he finally cracked the Lightning’s opening night roster one year ago. He didn’t enter quietly, either. His 64 points ranked third among all NHL rookies, one point behind Arizona Coyotes phenom Clayton Keller. Playing in all situations, including on the penalty kill, Gourde posted an unbelievable plus-34 rating. That was good for fourth-best in the entire NHL, ahead of teammates Victor Hedman (sixth) and Anton Stralman (ninth). It should come as no surprise then that Cooper chose Gourde to take Johnson’s spot, at least temporarily. The 26-year-old has proven to be reliable at both ends of the ice, a welcome sign on a team that’s encountered more than enough issues defensively over the years. He was also the lone bright spot on a penalty kill that ranked 28th in the league a year ago. 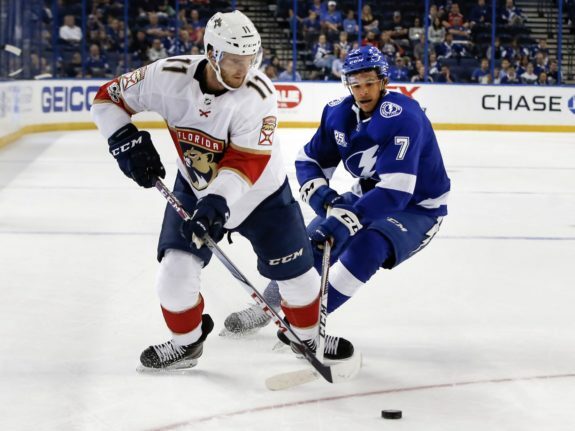 Once Johnson returns, it is likely Gourde will return to his third line duties with Anthony Cirelli and either Mathieu Joseph or Cory Conacher. That suits him fine, as he’s willing to do whatever it takes to help the Lightning win games. Penciled in as Callahan’s replacement on the fourth line, training camp sensation Mathieu Joseph found out he made the 23-man roster last Saturday night. His first official NHL practice Monday brought another surprise. The young forward found himself skating on the third line alongside Cirelli and veteran Alex Killorn. This move was necessary, with Johnson’s status unknown ahead of Saturday’s opening game against the Florida Panthers. Even so, the sudden jump up the depth chart had to feel good. In the preseason, Joseph found himself all over the lineup. One game saw him on the fourth line while another gave him the opportunity to skate alongside third-year pro Point and the always responsible Palat. His final preseason showing even had him with J.T. Miller and two-time Rocket Richard Trophy winner Steven Stamkos. No matter where he played, he dazzled. His eight points, off of four goals and four assists, led the Lightning’s scoring. His plus-five rating was tied with defenseman Slater Koekkoek for second on the team, only behind Mikhail Sergachev. He didn’t look out of place at all, facing both the Nashville Predators and Panthers NHL regulars. That, combined with an amazing preseason, likely helped the coaching staff decide to give the standout prospect not only a roster spot but also an expanded role on the team. While his status is up in the air once Callahan and Johnson return from their injuries, Joseph has an opportunity to make an impression. If he continues playing hard and smart, he’ll become a mainstay on the Lightning roster and possibly force his way up an already crowded depth chart. No matter what happens, the Lightning have options when the inevitable occurs. There will be injuries this year, and this team will be hit. Hopefully, they won’t be too serious, but if they are, this team has the players to fill in wherever needed and not miss a beat. *Yanni Gourde stats courtesy of Hockey-Reference.com. *Mathieu Joseph stats courtesy of CBS Sports.